Last year I was awarded the Ernest Annau scholarship, given out to one Canadian Undergraduate Student of Architecture every year, based on a travel-based research proposal and nomination by their school’s director. 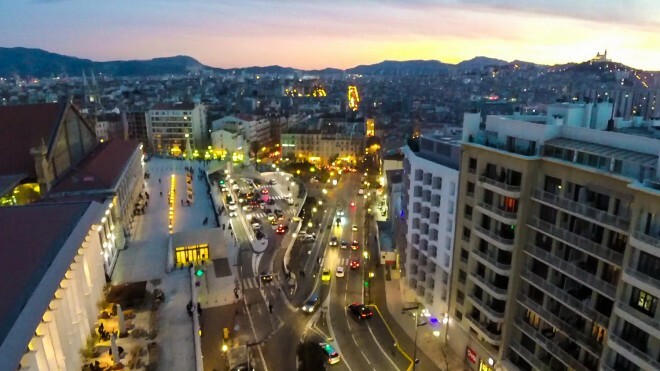 In my application I proposed to photograph the city from above with a drone of my own design. Though the exercise was intended as a travelling program, the things I learned and the points I want to make now all originated in the studio, as I leaned over my computer or soldering bench, or sat in front of the CNC mill while I put wings together. I want to talk about the Architect as a tool-builder, the growth and bounds of our CNC and 3D Printing revolution, and drones as an assertion of agency over the city. I should also admit that I was drawn to this ‘study’ in a purely childish way. I have always loved the thought of flying; this is a desire which is as basic to me as is my desire to build. Why I chose for my education the construction of firmly-mounted buildings is occasionally a mystery to me, but more often than not I see a strong harmony between the two desires. I’ve spent years dreaming of and occasionally designing aircraft, but have never had a formal education in the process. From what I can tell, designing a drone and designing a building (an exercise where I do have a formal training) are problems of the same kin. In both cases we have a strong link between form and function, and we find a design’s limits and constraints by way of discovery. We struggle through or within those constraints to put together a ‘complete work’ which is much more than the sum of it’s problems. Although they are governed by physics, we approach these design problems with a sense of intuition, which – hopefully – is informed by our mathematic model. A 550mm Span aircraft with a single propeller, carrying the same camera as the 250 size quadcopter. Remote or Autopiloted to a 5 or 6 kilometre radius, and capable of hovering while oriented vertically, using aerodynamic surfaces and onboard autopilot for stable control. 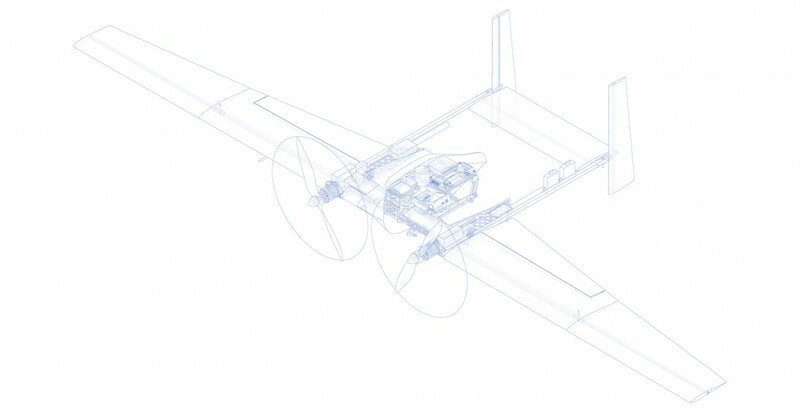 Being winged, aircraft are trickier to design than a quadcopter: they require some balancing. If you can imagine, there are a number of forces acting on an aircraft at any given time: and these forces change dynamically. We have lift and drag, weight and thrust, and momentary (rotational) forces. Traditionally the designer’s desire is to configure an aircraft so that it is ‘neutrally stable’ – so that all of these forces balance one another out. We also look for dynamic stability – a configuration where, when the craft is knocked out of a stable state by a gust or control input, it naturally returns to that stable state without any pilot input. These requirements have to be met mathematically, and they can be modeled fairly well (this is a ‘solved problem’ they say) – and building this model is a straightforward, accessible problem to anyone with an internet connection and basic understanding of mathematics. Of course this rigorous design of aerodynamic stability takes place within a larger design problem – structural, systematic problems need to be addressed. Where does the camera mount, component locations, a center of gravity needs to be maintained, the thing needs to be manufactured (hopefully quickly), and it shouldn’t cost too much. These things, although perhaps more straightforward, are difficult to model mathematically. This is where a ‘design’ mind in useful. We enter a kind of ‘play’ here: we juggle options and re-calculate, hold a number of decisions in states of possibility. We try to reach as far down the decision-tree as we can, and by some work of intuition come to a design choice. Where we balance and integrate the mathematic problem with the design problem is where a strong tool-set shows it’s strength. I believe that as we push into an architecture where new invention is paramount if not necessary, and while we look to improve the quantifiable performance of our buildings alongside their incalculable effects as human artefacts, we cannot ignore the importance of these digital tools. Engagement with digital craft changes a design to such an extent that the architect must now become the designer of these tools, not only the masters of their use. Today’s digital tools have risen far beyond simple drafting aides and challenge us to engage with an entirely new practice. 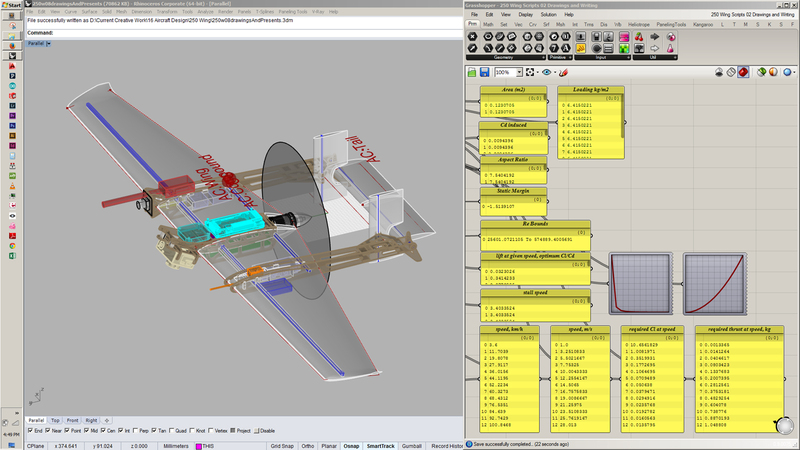 The grasshopper / rhino tool-space used to design aircraft. Useful figures are calculated and displayed automatically based on aircraft geometry and weight parameters specified in Rhino. In my practice, I’ve been building a digital tool-set in Rhino / Grasshopper that informs my design decisions against the mathematic model required in balancing aerodynamic forces. This way I can engage in the design through drawing and modeling, more or less free-hand, but see the mathematic results of my decisions as I do so. While I re-arrange components I see the center of gravity shift. When I change the shape of a wing I see where the center of lift moves, how the total lift is affected, and how much drag the wing generates. In this playful way, I gain a sense for the available design space intuitively, and I can wander more openly around it. One of the more interesting things I have discovered with the use of these tools is that with continued use I am submitted to learning the way the mathematics behave as I make rational and irrational decisions. After some practice with the tools, I now have a sense of how big a wing may need to be to carry certain components. I understand immediately how changing the size of a payload from 100-300 grams rolls through into weight gains in structure and power supply. A larger aircraft, same basic configuration as the 550mm version, capable of carrying a larger camera, or stabilization equipment, and up to 20km range. While many would say that the new digital drafting board is hindering intuition, I hope that we will see an emergence of tools which allow the designer to engage highly technical problems with an intuitive hand. The computer is able to provide a wealth of information for the designer (as we see in modern CAD/CAM/FEA Packages) – as they draw – although we rarely see it done in a straightforward way. To build out a digital craft which is informative as it is intuitive would be a worthwhile exercise, and this is where I hope to take my own studies. With the computer we can imagine the simplicity of sketch-modelling or free-hand drawing tied with the rigour of FEA (Finitie Elements Analysis) analysis and Dynamic Simulations. We can learn as we go and hopefully we can become better designers. I think the creation of the drone is also, in some far-off way, an act of architecture. The drone gives us new eyes, and looking is the first step towards building. Only in the last 110 years have we begun to see our city from above, and this view is now available at our fingertips in the plan-form. But there is something deeply unsatisfying about this plan view in a kind of raw sense. We do not stare onto it as we stare out of the plane window. We do not engage with a map the same way we engage with a space. This comes from a difference in agency. A visitor to a building experiences the space wholly, and their ability to move within it is paramount to the experience. The drone is the tool which would open this active, spatial experience of the whole city to the masses who inhabit it. 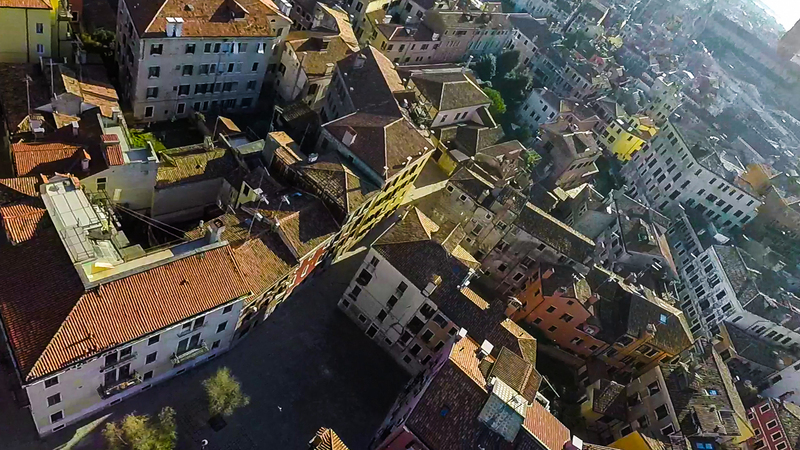 To fly around with the eyes of a drone is a different experience than the plan-view we now have access to. We can engage with the city spatially – we move around in it, and we have a presence there. To finish with tools; the 3D printers made popular a few years ago are now often used in the contruction of drones. I believe much of the excitement around 3D printing is rooted in an excitement to engage with the built world – I think that drone-building does the same thing for the engagement to the city where we reside. Then the tool is at the heart of it all: our ability to build, our ability to see and to engage. This is what the architect does, and I am hopeful that this is what we all will be able to do, in varying degrees, in the near future. Jake is a student of Architecture working on CNC Machine Design at Otherlab in San Francisco, and with Forrest Meggers’ CHAOS Lab in Princeton.